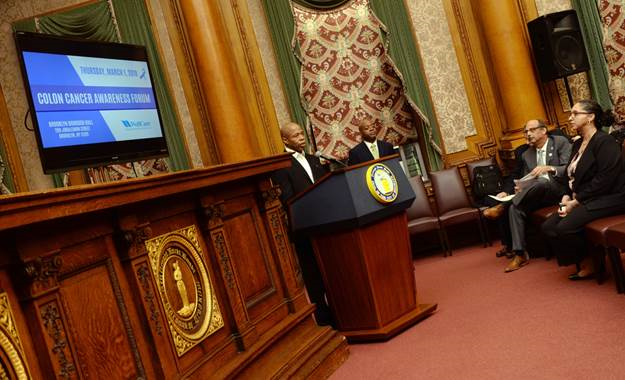 Brooklyn Borough President Eric L. Adams kicked off Colon Cancer Awareness Month by hosting a community forum in the Courtroom of Brooklyn Borough Hall where he joined colon cancer survivors, gastroenterologists, and oncology nutritionists in highlighting that the disease is curable, treatable, and preventable. Central and eastern Brooklyn, in particular, have been hit particularly hard by colon cancer, especially among African-Americans; men in East New York have the highest death rate for this disease in the entire borough. Symptoms can include change in frequency of bowel movements, change in consistency of stool or any blood in one’s stool, weakness and fatigue, or unintended weight loss. Colon cancer is the third-deadliest cancer in the United States, and the third-leading cause of cancer death in Brooklyn. The forum, sponsored by WellCare with partnership from Burger UrWay, P.C. Richard & Son, Target, and Whole Foods Market, included a discussion of the latest research on the disease, and important information on the impact of factors such as genetics and nutrition. In discussing the importance of preventive health, Borough President Adams also promoted his month-long #NoButtsAboutIt campaign to encourage mass participation in free colon cancer screenings being held for uninsured or underinsured persons, in partnership with the American Cancer Society, at 10 hospitals across the borough throughout the month of March. Borough President Adams emphasized the importance of early detection and getting screened in the fight against colon cancer. Borough President Adams’ #NoButtsAboutIt campaign was inspired by his special assistant Gerald Marcus Harris, who survived a battle with colon cancer last year. In recent weeks, he has traveled around the borough to speak about the importance of getting screened, with an emphasis on the fact that he was diagnosed with the disease at 37 years of age; many medical professionals, including the American College of Gastroenterologists, recommend Black men be screened starting at age 45. Free colon cancer screenings will be made available for uninsured or underinsured persons throughout March, as part of the #NoButtsAboutIt campaign, at Brookdale University Medical Center in Brownsville, The Brooklyn Hospital Center in Fort Greene, NYC Health + Hospitals/Coney Island in Sheepshead Bay, Interfaith Medical Center in Bedford-Stuyvesant, NYC Health + Hospitals/Kings County in East Flatbush, Maimonides Medical Center in Borough Park, New York-Presbyterian Brooklyn Methodist Hospital in Park Slope, SUNY Downstate Medical Center in East Flatbush, NYC Health + Hospitals/Woodhull in Bedford-Stuyvesant, and Wyckoff Heights Medical Center in Bushwick. 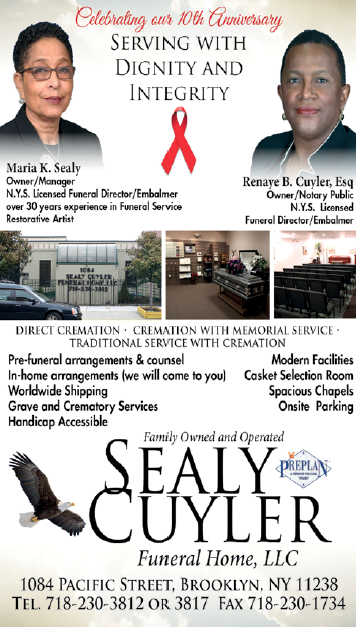 To schedule a free screening at one of the participating hospitals, interested persons can call (718) 802-3847.